I want to encourage young couples in their marriages. But you might be looking at me and I’m from another generation and say she doesn’t know how it works today. 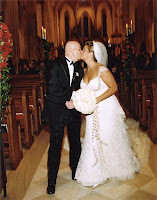 Well, n the next few weeks I hope to add some thoughts from our board members and how they keep their marriages strong. Sometimes just seeing someone else’s story can give you hope. These are real people, with real lives and stories. Mollie Surratt has just recently joined our board. She has a strong heart for marriage. Some of you may have seen her with her Mom Lori who is the star of “Say Yes to the Dress”. It may seem like their family is about the wedding, but I have seen their heart and it’s more about the family and getting it started strong. Thank you Mollie and Jason for sharing your story. Mollie and Jason were married on October 4, 2008. It was a beautiful fall wedding with over 250 family and friends! Each year, they really focus on setting aside time to celebrate their anniversary. The couple watches their wedding video, flips through the wedding album and talks about favorite memories from the day. Also, the couple tries to revisit their wedding reception venue every year to have dinner and spend the night. Whether your wedding was big or small, it’s important to remember the vow you made on that special day and recommit year after year. Through the craziness of everyday life with work, children and pets, Mollie and Jason feel this annual ritual reminds them of how happy and in love they felt that day and how blessed they are to be together now. Check out our website www.marriageisforever.org and learn more about us and what we are doing in Dalton, Chatsworth and Calhoun. It’s the little things that make a difference. Let’s make a difference.